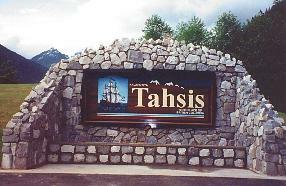 Tahsis Part of the BC Adventure Network. Over a million web site visitors annually ! Long before, Captain James Cook landed at Friendly Cove in Nootka Sound, the Mowachaht people used Tahsis as their wintering headquarters. It was also the gateway to the valleys of the Tahsis and Nimpkish Rivers, which were trading routes to the east side of Vancouver Island. Tahsis comes from the Mohachaht word "Tashees" meaning gateway or passage. Except for the fur trade, this part of Vancouver Island, British Columbia, remained unchanged until the early 1900's when logging was introduced. 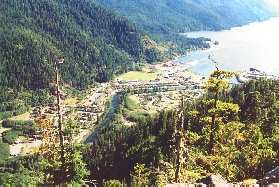 This forestry community at the head of Tahsis Inlet is 70km (43mi) northwest of Gold River on a gravel road. It started as a floating logging camping the 1940's, which later became a permanent on-shore camp. In the 1950's it expanded and a village took shape. In 1972, the road from Tahsis to Gold River was opened to the public, attracting new families, housing and community facilities followed. The scenery is rugged and beautiful with evergreen forests, snow-capped mountains, lush valleys, clear lakes and streams, unspoiled beaches and coves. Canoeing, kayaking, caving, fishing, and hiking are all very popular in this region. Climate: Typical west coast marine climate. Cool wet winters. Summer temperatures average in the low 20 degrees Celsius. The Great Walk is an annual fund raising event sponsored by the Tahsis Lions Club. It takes place on the 63.5 kilometres of gravel logging road between Gold River and Tahsis on Vancouver Island, and covers some of the most beautiful and rugged country in the world. The Great Walk has been sponsored by the Canadian Volksport Federation. For information please visit the Great Walk website at www.greatwalk.com. Main Industries: Logging, fishing and tourism. Access: Tahsis can be reached by water, road and air. From the Pacific Ocean, you can reach the Village by way of Nootka Sound into Tahsis Inlet. To reach Tahsis by road, from the Vancouver Island Highway (Hwy. 19), follow Highway 28 at Campbell River west to Gold River, from here follow the signs northwest. By air, there are regularly scheduled float plane services from Gold River, a charter out of Campbell River and a helipad near the head of the inlet. Recreation Facilities/Activities: Community Recreation Centre; museum; kayaking, boating, fishing, hiking and caving. Accommodations: Tahsis offer hotels, motels, resorts, bed and breakfasts, RV parks and campgrounds.